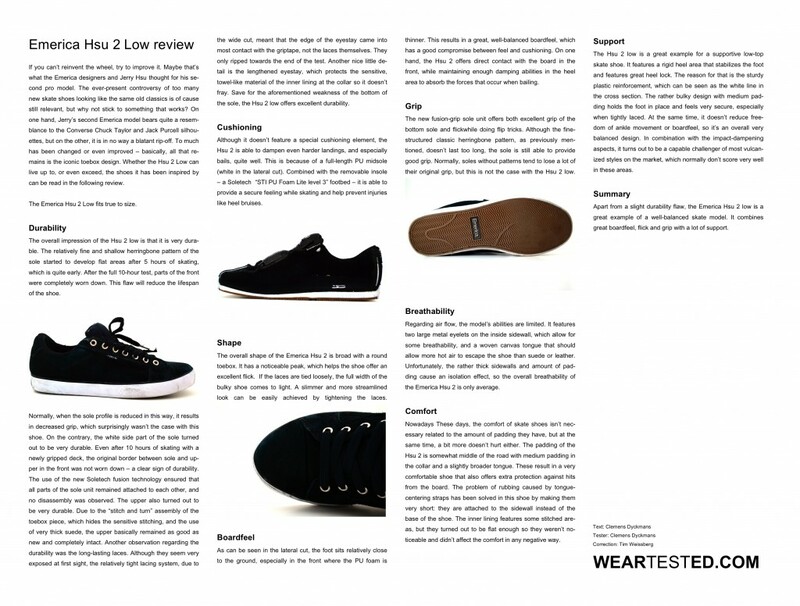 Due to some changes, the Emerica Hsu 2 Low has been tested in late 2011 but it took until now to publish the review. The long waiting time was hopefully worth it, the model itself definitely is. Thanks to Sole Tech Europe for the test samples. If you can’t reinvent the wheel, try to improve it. 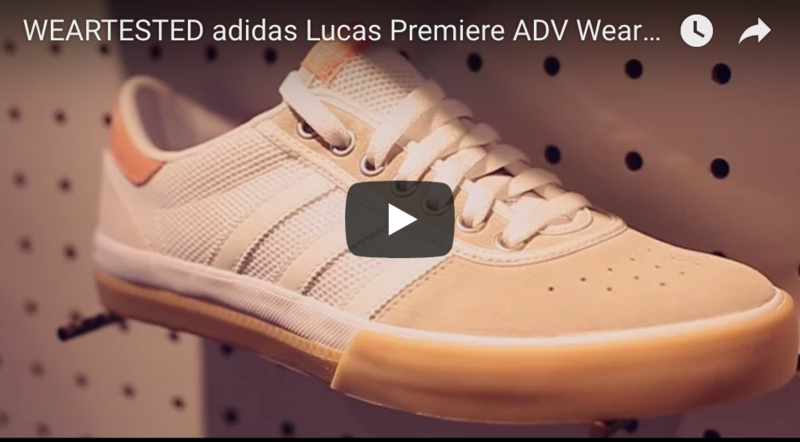 Maybe that’s what the Emerica designers and Jerry Hsu thought for his second pro model. The ever-present controversy of too many new skate shoes looking like the same old classics is of cause still relevant, but why not stick to something that works? On one hand, Jerry’s second Emerica model bears quite a resemblance to the Converse Chuck Taylor and Jack Purcell silhouettes, but on the other, it is in no way a blatant rip-off. To much has been changed or even improved ­– basically, all that remains is the iconic toebox design. Whether the Hsu 2 Low can live up to, or even exceed, the shoes it has been inspired by can be read in the following review. The Emerica Hsu 2 Low fits true to size. The overall impression of the Hsu 2 low is that it is very durable. The relatively fine and shallow herringbone pattern of the sole started to develop flat areas after 5 hours of skating, which is quite early. After the full 10-hour test, parts of the front were completely worn down. This flaw will reduce the lifespan of the shoe. Normally, when the sole profile is reduced in this way, it results in decreased grip, which surprisingly wasn’t the case with this shoe. On the contrary, the white side part of the sole turned out to be very durable. 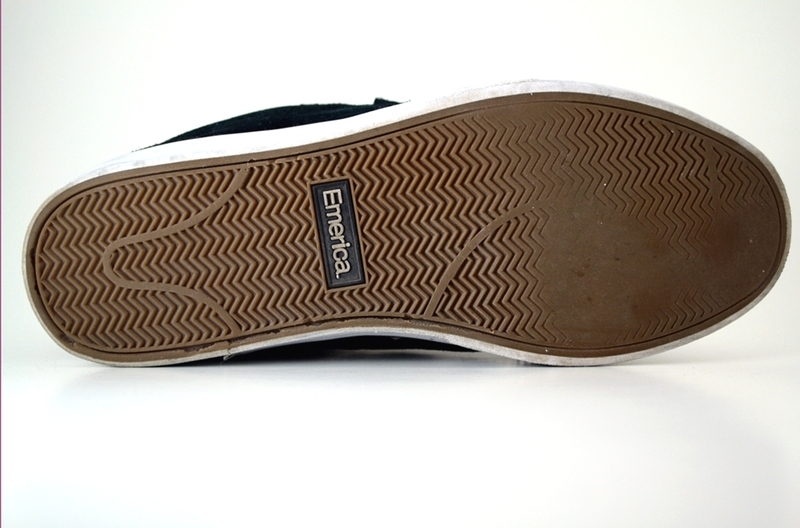 Even after 10 hours of skating with a newly gripped deck, the original border between sole and upper in the front was not worn down – a clear sign of durability. The use of the new Soletech fusion technology ensured that all parts of the sole unit remained attached to each other, and no disassembly was observed. The upper also turned out to be very durable. Due to the “stitch and turn” assembly of the toebox piece, which hides the sensitive stitching, and the use of very thick suede, the upper basically remained as good as new and completely intact. Another observation regarding the durability was the long-lasting laces. Although they seem very exposed at first sight, the relatively tight lacing system, due to the wide cut, meant that the edge of the eyestay came into most contact with the grip­tape, not the laces themselves. They only ripped towards the end of the test. Another nice little detail is the lengthened eyestay, which protects the sensitive, towel-like material of the inner lining at the collar so it doesn’t fray. Save for the aforementioned weakness of the bottom of the sole, the Hsu 2 low offers excellent durability. Although it doesn’t feature a special cushioning element, the Hsu 2 is able to dampen even harder landings, and especially bails, quite well. This is because of a full-length PU midsole (white in the lateral cut). Combined with the removable insole – a Soletech “STI PU Foam Lite level 3” footbed – it is able to pro­vide a secure feeling while skating and help prevent injuries like heel bruises. 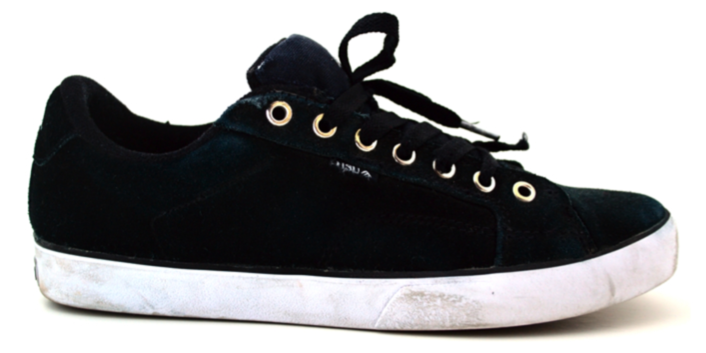 The overall shape of the Emerica Hsu 2 is broad with a round toebox. It has a noticeable peak,which helps the shoe offer an excellent flick. If the laces are tied loosely, the full width of the bulky shoe comes to light. A slimmer and more stream­lined look can be easily achieved by tightening the laces. As can be seen in the lateral cut, the foot sits relatively close to the ground, especially in the front where the PU foam is thinner. This results in a great, well-balanced boardfeel, which has a good compromise between feel and cushioning. On one hand, the Hsu 2 offers direct contact with the board in the front, while maintaining enough damping abilities in the heel area to absorb the forces that occur when bailing. The new fusion-grip sole unit offers both excellent grip of the bottom sole and flickwhile doing flip tricks. Although the fine-structured classic herringbone pattern, as previously mentioned, doesn’t last too long, the sole is still able to provide good grip. Normally, soles without patterns tend to lose a lot of their original grip, but this is not the case with the Hsu 2 low. Regarding air flow, the model’s abilities are limited. It features two large metal eyelets on the inside sidewall, which allow for some breathability, and a woven canvas tongue that should allow more hot air to escape the shoe than suede or leather. Unfortunately, the rather thick sidewalls and amount of padding cause an isolation effect, so the overall breathability of the Emerica Hsu 2 is only average. Nowadays These days, the comfort of skate shoes isn’t necessary related to the amount of padding they have, but at the same time, a bit more doesn’t hurt either. The padding of the Hsu 2 is somewhat middle of the road with medium padding in the collar and a slightly broader tongue. These result in a very comfortable shoe that also offers extra protection against hits from the board. 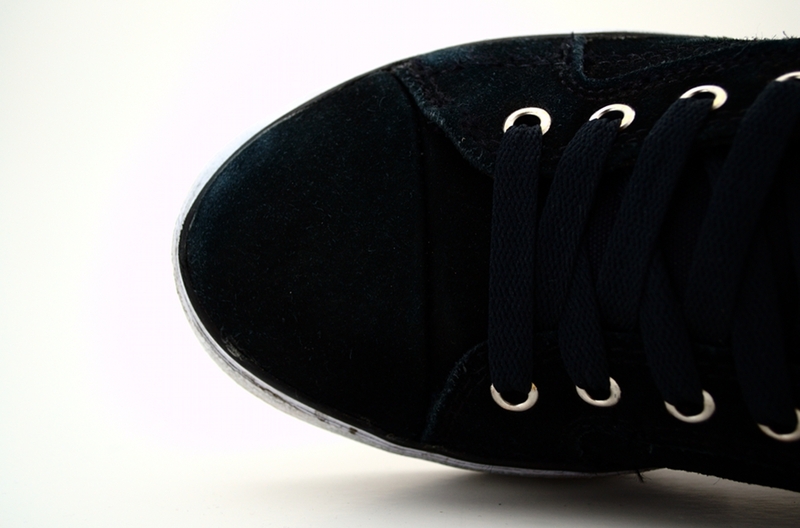 The problem of rubbing caused by tongue-centering straps has been solved in this shoe by making them very short: they are attached to the sidewall instead of the base of the shoe. The inner lining features some stitched areas, but they turned out to be flat enough so they weren’t noticeable and didn’t affect the comfort in any negative way. 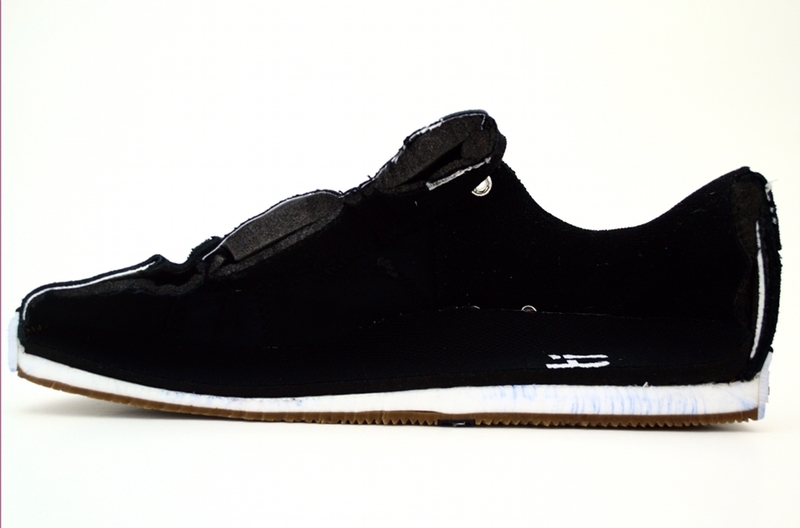 The Hsu 2 low is a great example for a supportive low-top skate shoe. It features a rigid heel area that stabilizes the foot and features great heel lock. The reason for that is the sturdy plastic reinforcement, which can be seen as the white line in the cross section. The rather bulky design with medium padding holds the foot in place and feels very secure, especially when tightly laced. At the same time, it doesn’t reduce freedom of ankle movement or boardfeel, so it’s an overall very balanced de­sign. In combination with the impact-dampening aspects, it turns out to be a capable challenger of most vulcanized styles on the market, which normally don’t score very well in these areas. 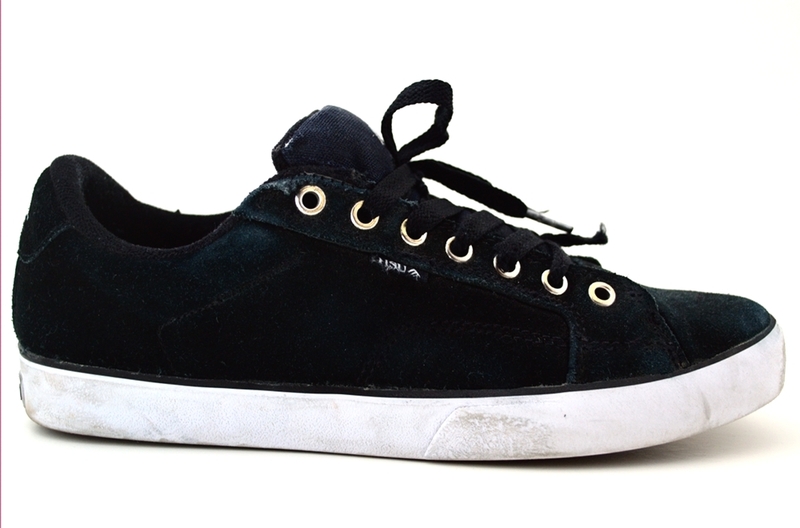 Apart from a slight durability flaw, the Emerica Hsu 2 low is a great example of a well-balanced skate model. It combines great boardfeel, flick and grip with a lot of support.